Join Ahimsa House for their 15 year celebration in helping people and pets who are victims of domestic violence reach safety together. This fundraising event takes place at Monday Night Brewing Garage; 933 Lee Street, Atlanta, GA 30310 Entrance is on White Street. Party is cocktail attire and includes: open bar, heavy hors d’oeuvres and gourmet desserts. There will be a live and silent auction, wine pull and raffles. Purchase tickets at ahimsahouse.org/celebration. is family-friendly, one-act musical production features iconic songs like "Somewhere Over the Rainbow" and "Follow the Yellow Brick Road” from the original movie score but arranged in the styles of Bluegrass and Americana. While remaining true to the well-known story and familiar characters, the Alliance’s version uniquely draws inspiration from American Folk Art to create a magical production that will surprise and delight all ages. is timeless story reminds us that no matter what you’re searching for, you don’t have to look further than your own backyard. Alliancetheatre.org. e 4th annual Atlanta Brunch Fest will be held on Saturday, March 9th from 12-4pm, with VIP entry at 11am. Close to 50 restaurants will be participating in the event and they will all bring their tastiest brunch items for the crowd to sample. ere will be Bloody Mary's, mimosas, Brunch Punch, as well as a selection of beer and wine to choose from. Live music and everyone's favorite DJ Q-Tip will get the crowd moving. 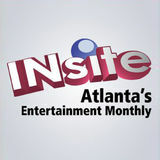 Visit their website atlantabrunchfestival.com for list of restaurants and menu items. Award-winning puppeteer Joshua Holden returns to the Center for Puppetry Arts for a limited engagement of The Joshua Show: Episode 2 from March 12-17. In this new production, Joshua’s right-hand man and the grumpiest grump, Mr. Nicholas, is planning to escape to outer space. Through singing, tap dancing and help from a cast of zany puppets, Joshua sets out to convince Mr. Nicholas to stay. Visit puppet.org. tenor in the world and makes his return to the Schwartz Center with bass-baritone Eric Owens, who has brought his powerful and expansive voice to stages around the world. The pair will be accompanied by Myra Huang. Tickets at arts.emory.edu. In Dominique Morisseau’s Pipeline, Nya Joseph is a dedicated, inner-city public high school teacher who is committed to her students’ achievement, while she sends her only son, Omari, to a private boarding school. When Omari is involved in a controversial incident which threatens him with expulsion from his school, Nya is forced to reconcile Omari’s anger, her own parental decisions, and the public and private school systems, as she rallies to save her son. Following five sold out nights in 2017, The Atlanta Opera will give an encore presentation of Astor Piazzolla’s Maria de Buenos Aires, the story of a woman born on a day “when God was drunk” who falls in love with the tango. Performances take place at Le Maison Rouge located inside Paris on Ponce. “We are thrilled to bring back this powerful tango opera to Atlanta and Paris on Ponce, which will, once again, transform into a seedy, Tango nightclub” says the director Tomer Zvulun. AtlantaOpera.org. Step into the future at a remarkable concert by a one-of-akind performer. Holographic recording artist Maya Kodes is a singer who released a dance pop song on iTunes, recorded an EP, and amassed over 5,500 Facebook followers, all as a hologram! Created by Neweb Labs of Montreal, the company uses artificial intelligence, holography, and motion capture technology to produce 3-D animations and virtual personalities. 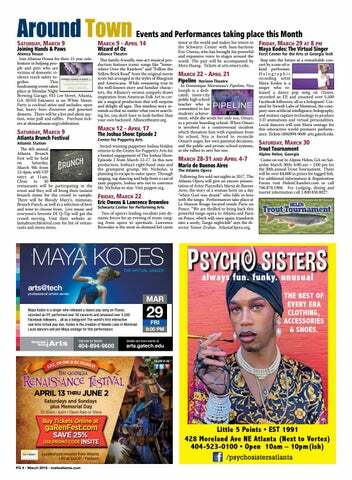 Local dancers will join Maya onstage for this interactive world premiere performance. Tickets (404)894-9600 arts.gatech.edu. Come on out to Alpine Helen, GA on Saturday March 30th; 6:00 am – 2:00 pm for the 30th annual Trout Tournament. There will be over $4,000 in prizes for tagged fish. For additional information & Registration Forms visit HelenChamber.com or call 706.878.1908. For Lodging, dining and tourist information call 1.800.858.8027. Maya Kodes is a singer who released a dance pop song on iTunes, recorded an EP, performed over 30 concerts and amassed over 5,500 Facebook followers…all as a hologram! The world’s first interactive real-time virtual pop star, Kodes is the creation of Neweb Labs in Montreal. Local dancers will join Maya onstage for this performance. Call now for tickets! always fun. funky. unusual THE BEST OF EVERY ERA CLOTHING, ACCESSORIES & SHOES.